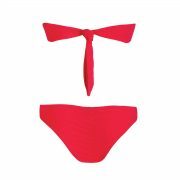 This striking bikini top is strapless and ties at the back. An ornamental clasp, featuring pearls and blue gems, at the focal point of the bust, give this top an air of exclusiveness. The bottoms are a classic cut, the back features ruffles to emphasize your curves, and there are matching clasps at the hips. This vibrant coral bikini is made of an innovative new-generation Italian lycra that dries quickly and is comfortable to wear.